Dr What was one of the greatest inventors of the 19th century. Click here to play! And the 28th century. And pre-history. His invention of a working Time Machine pretty much makes him the best inventor of all time, as he can invent things throughout all time. Now (also, later and before) he travels the universe and history in search of adventure and opportunities to gamble. Join him in his travels and you could end up the richest gambler throughout the ages! 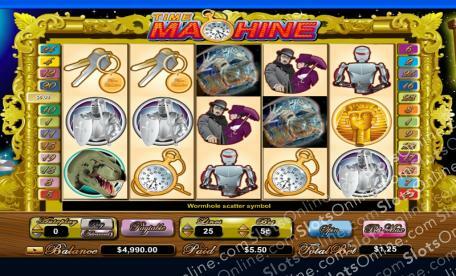 In the Time Machine slots, you must line up symbols from various eras in order to travel back to that time. Each period of time offers its own riches, with prizes to be claimed from the ancient Egyptions, medieval Europe, the pre-historic age of the dinosaurs, the Victorian era, and the distant future. Look out for wormholes and other time travelers for the biggest prizes of all. Hop into the Time Machine slots now to have the time of your life! The Wormhole symbol is the scatter, paying out on the total bet when 2 or more land on the reels. It also awards 15 free spins when 3 or more land on the reels, at a double prize multiplier. The Time Traveler symbol is wild, and it can substitute for any symbol other than the scatter. Autoplay can be set to complete on a number of spins from 1 to 99, plus it can be set to a certain number of lines and to a certain bet size per line. It may also be set to stop on a particular win amount, on a cumulative win total, on a cumulative loss total, or on the completion of free spins.